Aquí estoy un mes más con Simply A Moment, una propuesta de Alexa que consiste contar de una manera sencilla un minuto de tu vida, una vez al mes, que ocurra más o menos a mediados de mes. La presentación es completamente libre, un LO, una página de un diario, art journaling, un collage o simplemente algo de escritura y una foto. Este mes he he ido a lo más simple y solo he escrito un texto acompañando a una foto que hice el miércoles al volver a casa cuando me recibieron Luz y Vicente. Espero que disfrutéis con mi historia. Hasta pronto. I'm again with Simply A Moment, by Alexa, which consists in a simple description of one minute of life, made mid-month, and that ca be varied in form, a LO, a diary page, art-journal, a collage or just a piece of writing and a photo. 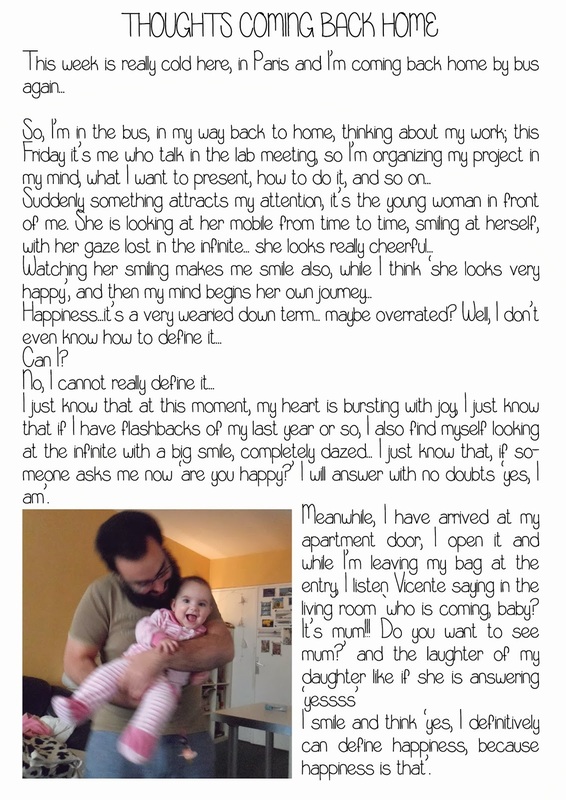 This month I have just written a text and add a picture that i took last Wednesday when I arrived home and I was received by Luz and Vicente. I hope you enjoy my story. See you soon. I really like your post! it is true we can find happiness in the little things in life. thanks!! she is soooo cute!! I love how you went from work to home both physically and mentally. Happy is a good place to be. Thank you for visiting me. yes, coming back home each day is like changing of universe... this is why I like to come back walking, but not if it's raining!! What a great capture of a moment. Thanks for taking me to Paris. thanks! it's very funny to play with her!! I am so sorry to be so late catching up (mini-crises of various sorts here). What a lovely photo, full of life and energy - I can just hear the giggle of pleasure as your delightful daughter greets you! I've really enjoyed listening to your 'voice' as your moment on the bus unfolded ... The happy conclusion have left me warm and smiling inside too! Thank-you so much for joining in this month and it is a pleasure to see your link - you have brought us all a lot of happiness in this post :). Me encanta tu blog, y me gustaría saber si por favor puedes decirme que tipo de caligrafia (font) has usado en este "Simply a moment" pues es de las más bonitas y sencillas que he visto. besos y muchas gracias por tu piropo! !